Registration is ongoing for the 2017 International Ocean Colour Science meeting (IOCS-2017), which will take place from 15 – 18 May 2017 in Lisbon, Portugal. The meeting is convened by the IOCCG in partnership with, and thanks to sponsorship from the European Commission, EUMETSAT, ESA, NASA, IPMA and Thales Alenia Space. The primary focus of IOCS meetings is to serve as a venue for the ocean colour community to communicate their views, ideas, concerns and issues with the satellite agencies. The programme for the IOCS-2017 meeting will include invited keynote lectures, agency talks, several breakout workshops, community discussions, NASA, Copernicus & VIIRS town halls, and poster sessions. All submitted abstracts will be presented as posters (see schedule-at-a-glance). Abstracts for posters (deadline 1 April 2017) can be submitted online. A limited number of travel scholarships are available for students, post-docs and other participants who can demonstrate the use of ocean colour radiometry data in their current research. These scholarships are being funded by IOCCG, EUMETSAT/Copernicus and the Joint Research Center (JRC). Apply online for scholarships (deadline 15 March 2017). Two training courses are being offered on Friday 19 May 2017 following the meeting, and will run concurrently: i) training on the Copernicus marine data stream and ii) training course on SeaDAS updates and future directions. Register online for these training courses (deadline 31 March 2017). Remember to book your accommodation as soon as possible as rooms are at a premium at this time of the year (see Logistics). Hotel deadlines start from end of February 2017! The 22nd Annual IOCCG Committee meeting took place in Perth, Australia from 7-9 February 2017 and was hosted by CSIRO, Australia. A total of 29 Committee members plus invited participants attended the meeting. The agenda included status updates of the IOCCG working groups, presentations by national agencies, group discussions on various topical issues including Essential Climate Variables (ECVs), implementation of the OCR White Paper through the newly formed OCR-Implementation Team, training and capacity building initiatives, and arrangements for the upcoming IOCS meeting. At the conclusion of the meeting the current IOCCG Chair, Stewart Bernard, stepped down and was succeeded by the incoming Chair, Cara Wilson, who is warmly welcomed. Stewart Bernard noted that it was a privilege and honour to chair the IOCCG Committee as there were few communities like IOCCG. He was congratulated on his remarkable tenure as Chair of the IOCCG Committee, and thanked for his service. The full minutes of the meeting will be available on the IOCCG website shortly. The radiative transfer model, called OSOAA (Ordres Successifs Océan Atmosphere Avancé) is now available as an open source software. 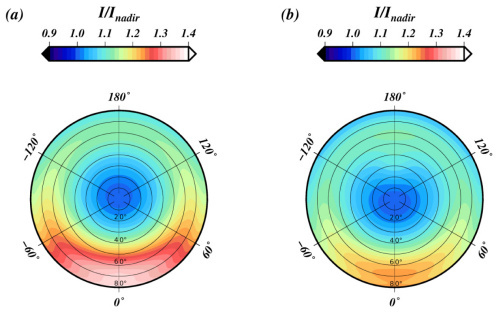 The OSOAA model is able to simulate the radiance and degree of polarization for an atmosphere-ocean system and for a rough sea surface (see Chami, Lafrance, Fougnie et al., Optics Express, 2015). Note that OSOAA also offers a user-friendly interface. The Sentinel-2 mission is the second in a twin satellite constellation– Sentinel-2A has been in orbit since June 2015 and the Sentinel-2B satellite is almost ready for launch on 7 March 2017. It has been shipped from ESA’s site in the Netherlands – where it had been undergoing testing since June 2016 – to French Guiana. Once Sentinel-2B is operational the time it takes to image the globe will be cut in half (to five days), with two satellites in orbit. Concurrently, the Sentinel-2 mission control team at ESA’s operations centre in Germany has already begun intensive simulation training for the critical launch and early orbit phase. 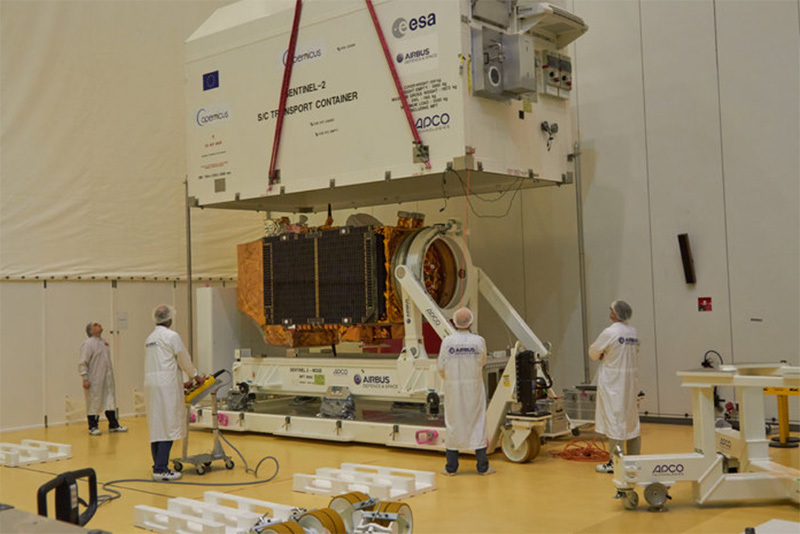 Sentinel-2B is scheduled for liftoff on 7 March at 01:49 GMT (02:49 CET; 22:49 local time on 6 March). See ESA News from 13 January 2017 and 16 February 2017 for full details. Sentinel-3B is scheduled to be launched in the middle of this year, and like Sentinel-2B it is designed as two satellites working in tandem. The Ocean and Land Colour Instrument (OLCI) on Sentinel-3 monitors the global oceans and inland waters, and provides critical near-real time information for numerous applications including phytoplankton concentration, water quality, harmful algal blooms, sediment transport in coastal areas. It will provide global coverage every two days. This 20th – 21st June in Plymouth UK, join an international workshop designed for those interested in the validation of satellite data, to discuss the performance of Sentinel -1, -2 and -3 at retrieving ocean colour, sea surface temperature and upper ocean dynamics in open ocean and coastal environments. 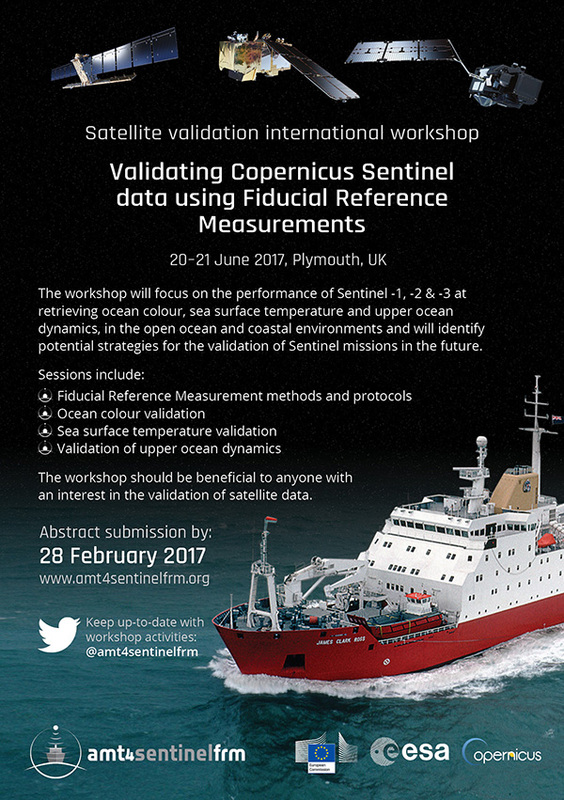 The workshop will identify potential future strategies for the validation of Sentinel missions and will address four main themes: Fiducial Reference Measurement methods and protocols, ocean colour validation, sea surface temperature validation and validation of upper ocean dynamics. Presentations and posters from participants are welcome and there will be an opportunity to submit papers from the workshop to a special issue of a remote sensing journal, abstract submission for the workshop closes on 28th February 2017. Confirmed speakers include experts in remote sensing and earth observation from around the world who will be presenting their latest research on infra-red radiometry, C-band radar, validation of satellite products in open ocean and coastal waters and atmospheric correction. This event is part of the Copernicus Sentinel Atlantic Meridional Transect Fiducial Reference Measurements Campaign (AMT4SentinelFRM) which aims to provide high quality Fiducial Reference Measurements (FRM) to validate Sentinel ocean colour and sea surface temperature satellite products. The campaign is led by Plymouth Marine Laboratory, UK in collaboration with international partners. What is a Fiducial Reference Measurement (FRM)? A Fiducial Reference Measurement is an in situ measurement taken which follows satellite validation protocols and procedures, is independent from the satellite retrieval process and maintains an associated uncertainty budget over the duration of the satellite mission. An FRM is also accessible to other researchers allowing independent verification of processing systems and has documented SI traceability. To find out more about the event and register/submit an abstract please visit amt4sentinelfrm.org. The NOAA/STAR Ocean Colour Environmental Data Records (OC-EDR) team has been continually developing experimental products produced by NOAA Multi-Sensor Level-1 to Level-2 (MSL12) ocean color data processing system. 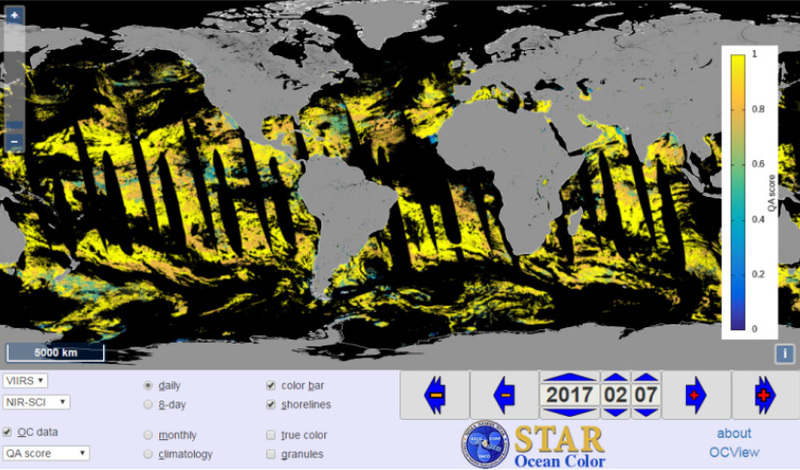 Global ocean colour products are available for viewing using the OCView tool. The latest addition to the developmental product line is the QA score (Wei et al., 2016) applied globally to VIIRS (Fig. 1). 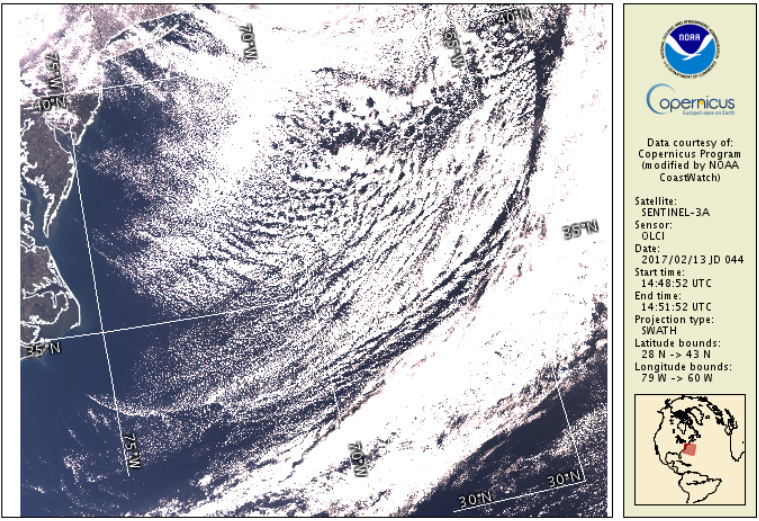 In May 2016, the OC-EDR team publically released the ocean colour science quality data for VIIRS, including the reprocessing of valid mission-long data (beginning 2 January 2012) and the routine forward stream processing which generates data on about a one-to-two week delay from present. Several components distinguish MSL12 ocean colour science quality data stream from the near-real-time data stream, the most significant of which is the ocean colour improved Satellite Data Records (e.g., Sun and Wang, 2015, for additional relevant publications please see the publications page on the OC team website). Currently, eight data products are considered “standard products”: normalized water-leaving radiances (nLw’s) at five wavelengths, chlorophyll-a concentration, Kd(490) and Kd(PAR). The Kd(PAR) product was specifically requested by the Environmental Modeling Center at NOAA’s National Weather Service. Developmental QA Score product (based on Wei et al., 2016) for VIIRS on 7 February 2017 shown on OCView tool. Grey is land. Black is no data (clouds, glint and swath edges). This February 2017, NOAA CoastWatch/OceanWatch (a.k.a. CoastWatch, the data distribution portal for NOAA’s developmental satellite data for oceans (NOAA/STAR/SOCD)) released a revamped website and new data discovery tools to facilitate user groups with a range of skills and sophistication to find and download ocean satellite data products and images in several common formats (e.g., NetCDF and PNG). VIIRS MSL12 standard ocean colour data products are accessible through CoastWatch, including global coverage at native resolution as granule data (L2) and various binned and mapped products (L3) for both science quality and near-real-time. Look to the ocean color product pages or use the granule selector tool (see figure below). Contact the CoastWatch helpdesk for further assistance. Screen shot of the new granule selector tool for NOAA VIIRS ocean color L2 swath data products and for Copernicus OLCI-Sentinel-3 true color (L1B). NOAA CoastWatch/OceanWatch is now distributing Level-1B full resolution data from OLCI-Sentinel-3A Copernicus mission. Level 2 ocean colour data products will be available upon formal release by EUMETSAT. In accordance with a Technical Arrangement with EUMETSAT, NOAA is the primary provider of Sentinel-3 marine data for the US. OLCI data can be accessed using the granule selector tool (and see above). True color image along the US East Coast produced by NOAA CoastWatch/OceanWatch from OLCI-Sentinel-3A data. 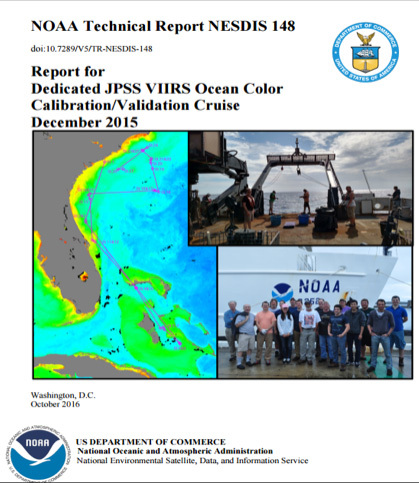 The NOAA/NESDIS Technical Report #148 for the second annual NOAA dedicated JPSS VIIRS Ocean Color Calibration/Validation Cruise in December 2015 has been published (Ondrusek et al, 2016). Building upon the success of the November 2014 field campaign, the December 2015 cruise took place again aboard the NOAA Ship Nancy Foster (NF-15-13). The 2015 cruise concentrated on Western Atlantic waters along the South East US Coast and into Bahamian waters, crossing the Gulf Stream multiple times. Twenty-seven stations were occupied over 12 days. Ten of those 27 stations covering 4 separate days resulted in good quality match-ups with VIIRS satellite observations. At each station, simultaneous measurements were made with a suite instruments to enable comparisons of validation measurement techniques. Optical properties were also surveyed continuously while underway by instrumentation plumbed into the ship’s flow-through sea water system and other instruments mounted on masts at the bow of the ship. Additionally, water samples were collected for chemical analyses of several environmental and biogeochemical properties. Cover of the NOAA/NESIDS Technical Report #148. Several new publications have been added to the IOCCG Recent References list including a paper by Wei, Lee and Shang (2016) who developed a novel quality assurance (QA) system to objectively evaluate the quality of remote sensing reflectance spectra (Rrs). The overall performance of a remote sensor is usually evaluated by comparing one set of data products (airborne or space-borne platform) with a ground truth dataset (shipborne); these comparisons are assessed one spectral band at a time. The new QA system evaluates each Rrs spectrum independently, regardless of how the Rrs spectrum is obtained. The QA system consists of two components: Rrs spectral references and a score metric. The reference system is characterized by 23 optical water types, ranging from purple/blue to yellow waters, with upper and lower boundaries defined for each water type. The scoring system assigns a score between 0 and 1 (1 = highest quality and 0 = lowest quality) to a target spectrum based on the reference. Therefore, the QA system provides a quantitative measure of the quality of a target Rrs spectrum. 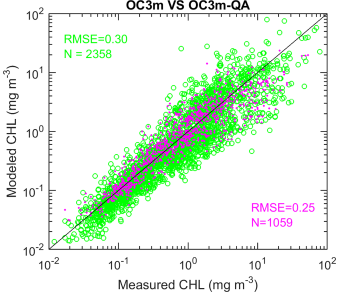 The authors tested this QA system with both synthetic and in situ Rrs spectra and found that it is robust and applicable to measurements from various instruments. In addition, the authors applied the QA system to the NOMAD dataset and satellite ocean colour data over coastal and oceanic water, and the QA system readily identified questionable or likely-erroneous Rrs spectra. As shown in this study, the application of the QA system to in situ datasets may improve the development and validation of bio-optical algorithms, thus helping to develop high-quality short- and long-term ocean colour products by excluding questionable Rrs data when applied to satellite Rrs products.